sunshine and whimsy. : my first juice cleanse. I have felt so blah for a long time. Bloated, gassy, tired, blah. So I decided to do a juice cleanse. For some reason, I decided to do the Transformation Cleanse: "This cleanse is made for green juice lovers and health nuts! Our most intense cleanse that digs DEEP inside the body to rid yourself of built up toxins that have been stored in the digestive system for years. This cleanse will yield the biggest results from weight loss to glowing skin. Transform your body from the inside out with this extremely powerful cleanse." Before I started, a few people asked me how I felt about it. I was excited! It wasn't until the night before I began the cleanse that I started to get nervous. Nervous because I wasn't going to eat any food for 3 days! And nervous I wouldn't like the juices. The juices were delivered the night before and I was ridiculously excited. Not kidding. It turns out, they were delicious! They definitely tasted "green" but in a good way. I really liked the second one, Green Love. I had been warned by a friend that the Slim-o-nade was disgusting and when I first began drinking it, I agreed. But after a few sips, it got better and I actually ended up liking it. I ended up looking forward to the Cashew Mylk all day... it was almost like a dessert. And now that I'm done the cleanse, I've even been craving the greenest juice, Master Green. I woke up excited to begin! The first juice tasted very green, but I got used to it. I felt great all morning. I almost felt like I was bouncing up and down the stairs, feeling lighter than I'd felt in a long time. I felt good. And then in the afternoon, I started to feel sick. Like I might even throw up. That feeling only lasted about an hour though and I was okay again. When I looked in the mirror in the afternoon, I thought, I think my face is less red. But I didn't know if that was just wishful thinking. I was hoping someone would confirm it. And then! A little while later, a friend—totally unprompted!— said, "I have to say, your face doesn't look as red today." (My face is always red.) Hooray! I went to the bathroom 16 times throughout the entire day. And there were a couple times I had to run to the bathroom and out came runny, green... you get the picture. Ick. But as someone said to me, that means the juice is doing its job. My body was getting cleaned out. Note: I had a slight headache the entire first day, but I don't think that was because of the cleanse because it had started the night before. Although, the company recommended cutting out caffeine for two days before beginning and I did that. Maybe that was the cause? Pretty much the same as Day 1, minus the stomachache and headache. Also, I was definitely feeling less bloated and two more people commented that my skin was looking better. 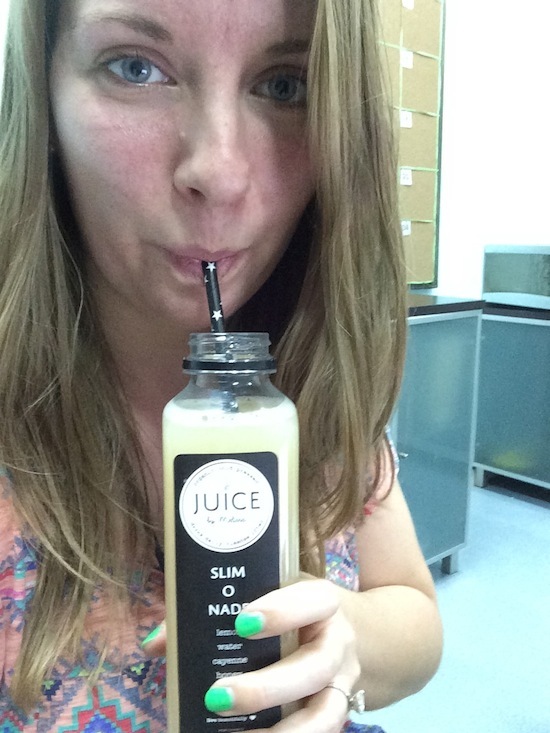 Still liked the juices and was even thinking maybe I should have done a 5-day cleanse! I felt fantastic! My stomach was definitely flatter! I don't think it was visible to other people, but I could see a difference in the mirror and it felt flatter. I wasn't bloated or gassy at all. I was wishing that I had done a 5-day cleanse and was even a little sad that this was the last day. I was a little surprised to realize that from all the things I could have chosen from the menu, I was craving greens! A salad and green smoothie it was! I had planned out what we'd eat for the week and made a grocery list the night before, so shopping was a breeze. Lots of fruit and veggies, eggs, chicken and salmon, Greek yogurt, etc. That night, we went out for a friend's birthday, and the plan was drinks and then all-you-can-eat teppanyaki. I felt like I shouldn't drink any alcohol or eat anything at the restaurant except for veggies and fish, but at the same time, I want to live a normal, balanced life. I ended up having two cocktails, but then drank only water at the restaurant. And I did eat all the food I wanted. And I felt a little gross when we got home. The next morning, I felt so disappointed in myself and asked Tony, "Did I just ruin everything? Did I drink juice for 3 days for nothing?" But then I realized that I had made better choices. And I definitely didn't eat or drink as much as I would have before. Did I actually look better or was it just in my head? Honestly, I don't know for sure. Only a few people said they noticed a difference, but I did. And I definitely felt better. And even if it was more mental, does that really matter if it's helped jumpstart me and my body, and I'm making better choices as a result? People kept asking if I was hungry and the truth is, I wasn't at all! I would think I was hungry, but then I'd pay attention to what I was really feeling and I'd realize I wasn't hungry. The juices really filled me up! I did miss the action of eating though. Being around other people who were eating, I didn't feel jealous of their food, just that they were biting into something. Evening was the hardest time, and I'm not even a snacker; I eat dinner and that's it. I think it was because I missed the action of eating and without work to keep me busy, I was thinking about how I wasn't eating for 3 days. 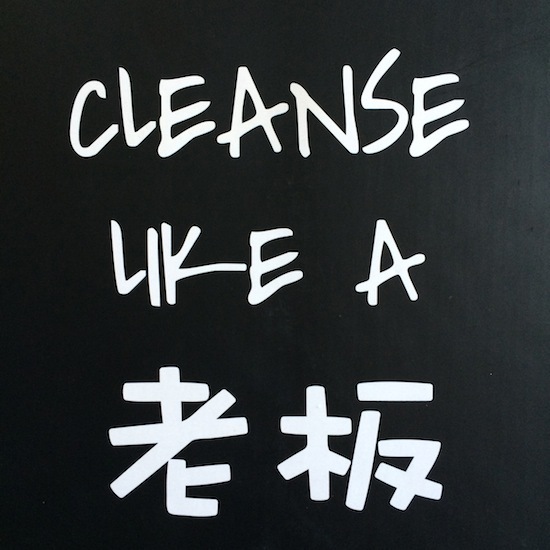 Cleanse like a "lǎobǎn." (Cleanse like a boss.) Love the branding! I am so glad I did this. I still feel good and I'm definitely making healthier food choices and motivated to keep it up. I'm already planning to do at least one more cleanse before I go home to Canada for the summer, if not two more. Green juice for the win! If there's anything you want to know, a question I didn't answer here, ask in the comments and I'll do my best to answer! This post is not sponsored. I wanted to do a cleanse, I paid to do the cleanse, and I wrote about the cleanse, partly so I remember how I felt and partly because I know people are curious. Thanks for sharing your experience, Amanda! This is one of my favourite posts of yours of all times! :) You can consider buying a blender and combine ingredients according to this popular infographic - https://www.pinterest.com/pin/542683823823350156/ - to make delicious-tasting green juices if you want to save money. I have a blender and make smoothies all the time! I just pinned this formula though, thanks! Oh I've been wanting to try a cleanse from Juice by Melissa. To be honest, I'm not one who is normally into diets/cleanses/whatever, but there's something about being here and feeling icky that makes me want to "refresh" or something with a cleanse! You've convinced me- I'm gona try it! I'll let you know how it goes! Yes, please let me know what you think! I really feel like my body's been "reset."